The Philosophy of Horror: Paradoxes of the Heart by Noël Carroll is a thorough, academic treatment of the major philosophical issues surrounding the horror genre. It focuses on two "paradoxes of the heart": the paradox of fiction (why are people scared of things they know don't exist?) and the paradox of horror (why does anyone like horror at all, since being scared is usually a bad thing?). Carroll's academic style is probably going to appeal mostly to academic philosophers, who will find it intellectually thorough, as opposed to general readers, who might find it pedantic and long-winded. Your mileage may vary. As an academic philosopher myself I appreciate Carroll's style, but as a horror fan I was excited to read a serious academic treatment of a genre that's often unfairly maligned as anti-intellectual or even immoral. 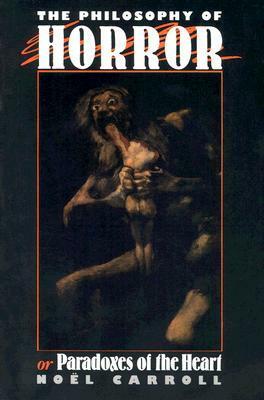 In fact, this book has become something of a classic in the still small area of philosophy of horror, so it's a useful touchstone for further research. I will add that even for an academic monograph, Carroll can be a bit repetitive. Carroll refers to a wide variety of examples throughout, from well known authors like Shelley, Lovecraft, Stephen King, Clive Barker, and Shirley Jackson to lesser known authors like Colin Wilson, from popular blockbuster films to obscure art house offerings. I added a lot to my to-read and to-watch lists. The first chapter attempts a definition of horror as a genre, a genre that is aimed at giving rise to the emotion of "art-horror" as Carroll calls it. He also spends some time characterizing the concept of a monster, which he takes to be central to most horror. The third chapter is an elaborate taxonomy of horror plot structures, which includes a large number of examples to make Carroll's case. The most interesting chapters to me were two and four: those that deal with the paradox of fiction and the paradox of horror respectively. Concerning the paradox of fiction, Carroll argues against several competing theories (such as the theory that horror actually gives rise to pseudo-fear) in favor of his own idea that the emotion of art-horror is a genuine emotion but it is produced by the idea of a monster (or other object of horror). I like this idea (ha. ), since it explains why some horror fans such as myself find horror fiction scarier than horror movies: my imagination goes places more frightening than any film can capture. Chapter four touches on what I think of as the most intriguing philosophical questions about horror: Why do fans of the genre like to be scared? Why does anyone like this stuff in the first place? Carroll considers and rejects a few other theories such as Lovecraft's theory of supernatural horror as a quasi-religious experience or various psychoanalytic explanations. His own theory is subtle and more complex than I can adequately reproduce here, but the basic idea is that, due to the category-blending, reality-transcending nature of monsters and other horror tropes as well as the investigation and discovery structures of many horror plots, horror excites the imagination and curiosity of its audience, an experience that is heightened by the emotion of art-horror. Carroll ends with an interesting discussion of horror and ideology (that is, is horror fundamentally politically and socially conservative as some have argued?). I greatly admire Carroll's book, but, as with any philosophy book, I'm not entirely sure I agree with everything. In particular, his treatment of monsters doesn't seem to capture horror stories where we're supposed to identify with the monster in some ways, as in everything from Mary Shelley's Frankenstein to Guillermo Del Toro's The Shape of Water. His resolution of the paradox of horror seems to fit a lot of other genres like science fiction and fantasy, minus of course the necessary ingredient of the emotion of horror. To the extent that I agree with Carroll about horror, I also agree that he explains a lot about why science fiction, fantasy, and horror are my favorite genres: it's all about exercising the imagination and confronting the unknown for me. It seems that Carroll might have leaned more on the role of art-horror in chapter four. Or maybe it just shows that demarcating strict borders between genres is difficult, if not impossible (case in point: Stephen King's Dark Tower series, which is equal parts horror, fantasy, science fiction, Western, and random weirdness). For me, Carroll's book raises further questions: Is it possible to define horror or to solve the paradoxes of fiction and horror in ways that fully capture every aspect of the genre? Is there a single framework that explains everything about the genre? Would it be a useful discovery if the answers to the previous questions were "no"? Whether one agrees with Carroll's conclusions or not, that he so seriously and so thoroughly engages with the deep philosophical issues surrounding horror as a genre makes it well worth the effort. I recommend it not just to academic philosophers but to anyone with the patience and curiosity to follow Carroll's own discovery plot to its end. See also my Goodreads review. Dean Koontz's book "Phantoms" terrified me on a level I didn't think possible. The movie version, while decent, didn't bother me at all. On the other hand, and not to get too weird, the Borg from ST:TNG gave me nightmares for several years after they appeared. I'll have to check out that book! The first time I really remember being scared by horror was probably Lovecraft's "The Call of Cthulhu." I had seen a hundred movies with Freddies and Jasons before that and mostly thought they were funny. The Borg are super scary!